Kurt Schwitters was born into a splintered age, and everywhere his works, in whatever medium he chose at a particular moment, express that fact. As materials for his collages, sculptures, and the Merzbauten, he chose to employ fragments rather than new-sawn planks or virgin paper, and in the same way he made use of flitters of ideas and forms from the past to construct new meanings and resonances: an old rowing-boat becomes an abstract Merz pillar, standing perhaps for a wave breaking on a rock; a gothic cathedral is shattered, to be reassembled as a Merzbau as convoluted as Gaudi’s forever unfinished Sagrada Familia basilica. Both artists were building new ideas from the outworn materials of a past world. 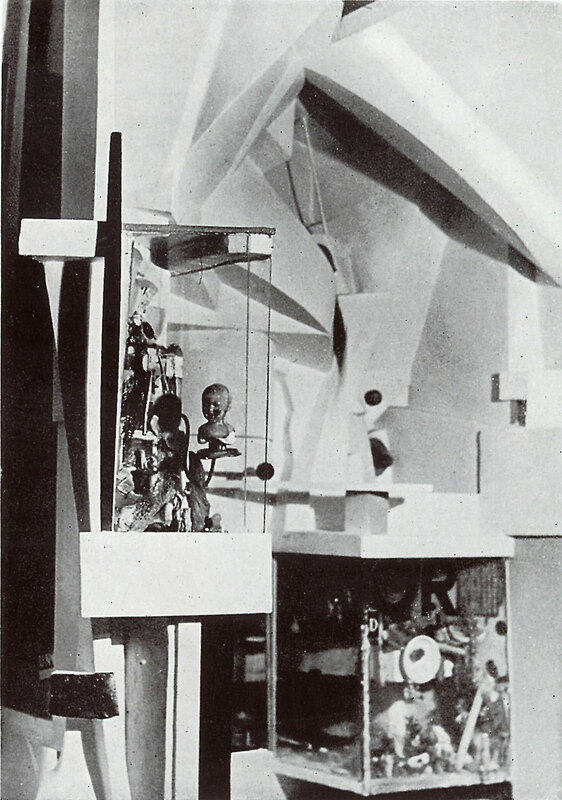 At the same time Schwitters was surrounded by the thrust of the new – Constructivism, Futurism, Minimalism – and in his typographical experiments, in his poetry, in his sound experiments, in his designs for a ‘basic’ theatre setting, he experimented with and subverted these new forms the instant that they came into being, adding where he thought it necessary his own particular form of anti-rationalism, or even whimsy. So many-sided were Schwitters’ talents, so varied the forms that he experimented with, that the influence his work has exerted on later artists, designers and architects is not particularly easy to discern. Drawing for a universal stage set, 1925. Rather it is that he influenced whole schools of thought, opening minds up to the possibilities opening up when the temples of art were blown into smithereens, allowing artists to incorporate elements from cinema, advertising, folk tale, birdsong, the old masters, into their work, in order to create new meanings for the present age. Covers for Schwitters’ children’s stories showing the artist’s use of stylistic dissonance. Of course Kurt Schwitters did not do this by himself. The whole age did it: the Dadaists and other iconoclastic souls, the chic Minimalists, James Joyce and his shattering of language, photography and cinematography and psychoanalysis, Schoenberg and Webern. A new world was coming into being; they were all part of it, and we are the inheritors. Nevertheless, for many artists it is Schwitters that they acknowledge as having exerted a special influence on their thinking and their work. Even here in Britain this is the case, where Pop Artists followed one of the tracks Schwitters had laid down when he began to incorporate scraps of advertisements into his collages, alongside reproductions of artworks from the past. The whole of Postmodernist architecture also lies seeded in the Hanover Merzbau, and has burst into flower in our own day in the edifices designed by Frank Gehry, Daniel Libeskind, or Rem Koolhaas. ‘Leaf House’, Turku, designed by the Finnish artist Jan-Erik Andersson, 2009. Around ten years after leaving Germany, and five after working on the Lysaker Merzbau, about which so little is known, Schwitters set to work on his final great Merz construction, the Elterwater Merz Barn. By this time, 1946, Schwitters had suffered 17 months of internment on the Isle of Man, deteriorating health, including a broken leg, constant financial insecurity, the death of his wife, the loss of what he had considered the crowning achievement of his life, the Hanover Merzbau. It would be surprising were he not a changed man, and if those changes did not show in his work. In fact the Merz Barn work was and is astoundingly different from Schwitters’ previous output. The photograph above, taken before the plasterwork began to deteriorate, gives a good idea of what we have lost, although the depth of the relief work needs to be seen. Side view of the Merz Barn installation. Contemporary photo. ‘..one of the key works of 20th century art .. the Dada equivalent of Durham Cathedral’. William Feaver. ‘..the most important work of modern British art’. Andrew Graham-Dixon. ‘My Merz Barn is better and more important than everything I have done up to now’. Kurt Schwitters (October 6th, 1947). Schwitters’ work in Germany and internationally was very well known before 1937, until the Nazis declared him a ‘degenerate’ artist and he had to leave his home in Hanover, his wife, his livelihood, his Merzbau. But in leaving his native country the artist also left behind his international status; the long years of war had closed countries in upon themselves and, in England at least, things German brought with them the taint of suspicion. We had out own brand of Modernism – Henry Moore, Barbara Hepworth – and that was enough for the time being. In Norway, and then in England, Schwitters began courageously to build up a new body of work. We do not know from the Lysaker sketches how that Merzbau was progressing, and the Schwittershytta on Hertøya is charming but much of the interior presumably pre-dates the changes brought about by the war. The Merz Barn therefore is, with the jaunty little sculptures that Schwitters made to show in it, the only example of the artist’s late three-dimensional work to survive. ‘Mother and Egg’, Kurt Schwitters, c. 1947. Property of the Thomas family. On loan to the Tate. Had Schwitters lived – he died in January 1948 – he would undoubtedly have made sure that the world knew about his latest work, for he was a superb self-publicist. But since he died in obscurity, with his son in living Norway, and no-one therefore to represent his interests, the Merz Barn artwork remained known only to very few, hidden away as it was in the Langdale Valley, until it came into sudden prominence when the ‘art-wall’ was moved to Newcastle. In later years the locals who visited Harry Pierce’s estate came to see the work and scoff. There is a story that when the Langdale climbing fraternity came to Cylinders to enjoy Jack Cook’s Thursday night hotpot suppers they sometimes hung their sisal ropes to dry on the artwork’s projections. So it was quite a while before this wonderful organic fusion of landscape and light was seen, and even longer before it began to be understood and celebrated, let alone to have an influence on the artists, architects and designers who lived on after the creator was dead. John Darwell: ‘After Schwitters: Hannover’. John Darwell: ‘After Schwitters – Hjertøya’. John Darwell: ‘After Schwitters – Isle of Man’. Images from John Darwell’s photo essay ‘After Schwitters’: Cylinders. Littoral commission. Images from John Darwell’s photo essay ‘After Schwitters’: Hanover, Hjertøya, Isle of Man, and Elterwater, 2008-2013. But all that has changed. The Merz Barn artwork is about to undergo a thorough restoration at The Hatton Gallery, and its status, long denied by those who saw the Merz Barn as the unfinished production of an enfeebled artist out of touch with his genius, has grown and is growing daily. Like all revolutionary works of art the Elterwater Merz Barn is an act difficult – impossible – to follow. The influence the work exerts on contemporary artists, designers and architects is not, could not be, a stylistic one, yet many artists admit to having been inspired by it. As Schwitters put it: ‘My spirit must not stop’. ‘Drahtfrühling’ collage by artist Martin O’Neil. Littoral commission. Photo: Martin O’Neil. Artist’s statement: ‘Drahtfrühling’ includes: A pressed Autumn Crocus from The Merz Barn – a present to the artist’s wife from Ian Hunter, plucked from the annually blooming clump that Edith Thomas planted in memory of Kurt Schwitters; and other memorabilia of the artist.